White kitchens and baths are definitely the hottest trend I am seeing right now. It's also the subject I get asked about the most. 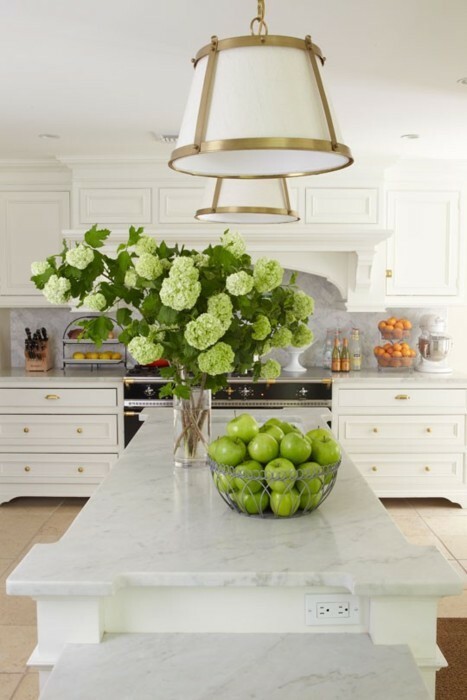 From white Carrara marble to white quartz there is a lot to consider when using white countertops. Whiteout Wednesday is a weekly feature where I show five kitchens and/ or baths that have used white in a beautiful way. If you have a white kitchen or bath that you would like to see featured here please email me. I have five really beautiful kitchens to show you all this week. This first kitchen is my favorite of the day. 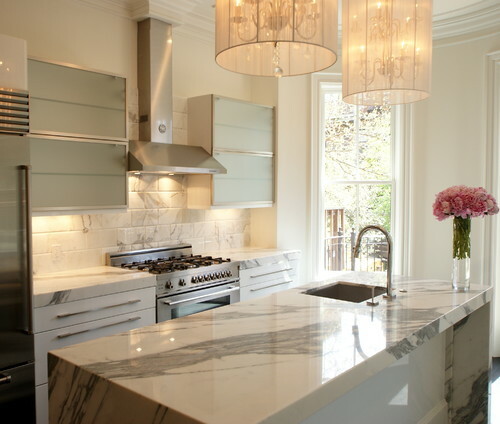 The island is perfect with it's stunning piece of marble, plus I'm a sucker for the Waterfall edge. I also really like the backsplash and the light fixtures. So I'm blaming you and Whiteout Wednesdays for my current obsession. 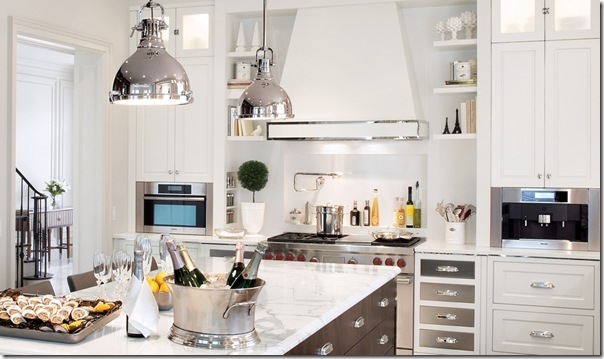 See, I used just like white cabinets and darker countertops and now I just can't get enough of all white. But I wonder if it really works well without dark, warm wood floors, because that's certainly what you see most of the time in this all-white kitchens. Anyway, these are all beautiful, but the first is my favorite just because of that amazing piece of marble. I have a nominee for a future whiteout Wednesday though and I've decided it's my perfect kitchen. Not sure what the counters are, but it looks like maybe a quartz. I agree, I think it's the dark warm wood floors that make these all white kitchens work. It keeps them from looking cold and/or sterile.